Ghost Hunting Theories: Most Unusual Find in America! 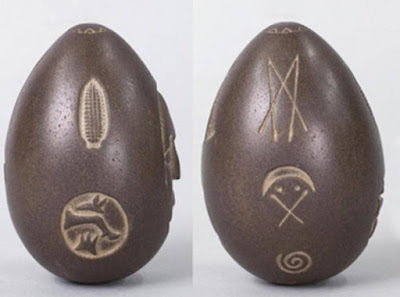 The Lake Winnipesaukee Mystery Egg is one such find that baffles. This artifact was found in 1872 while workers were digging a hole post in New Hampshire. It is 4 inches long, 2-1/2 inches wide, and weighs just over a pound. It is made of a very dark granite-like stone. Holes are bored into both ends and smoothly polished. 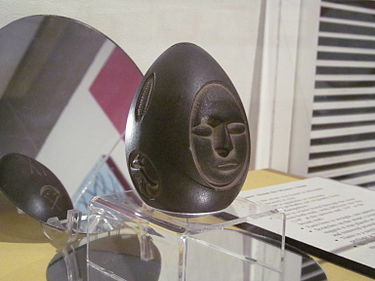 The stone (which is surrounded by mirrors showing off its symbols), is on display at the Museum of New Hampshire History. Some believe the stone is Celtic or perhaps Inuit. Others believe it was symbolic of a treaty between two tribes. It was made to go atop of a metal shaft. No matter who looks at it, one things comes to mind; this does no look like any Native tribes' work that has been seen before. It has been said that it even shows signs of being prehistoric made. This might even be designed by the potential original people of this continent - the giants. Out-of-place/out-of-time artifacts have been found around the world. They point out just how limited our archaeological and anthropological knowledge really is. This would be like walking into someone's home blindfolded, picking up an item out of one of the rooms and assuming their whole life based upon it. We come to make an entire existence, religious practice, and value system on that person based on the limited items we have retrieved. Items like the mystery stone keep us humble about the origins of man, his advancement in the past, and any outside influences that he might have experienced (from earlier cultures).